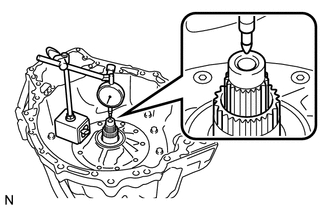 (a) Using a dial indicator, measure the input shaft sub-assembly end play. (a) Using a caliper gauge, measure the inside diameter of the bushings of the planetary sun gear sub-assembly. If the inside diameter is greater than the maximum, replace the planetary sun gear sub-assembly. (a) Check if the contact surfaces of the No. 3 brake discs, No. 3 brake plates and No. 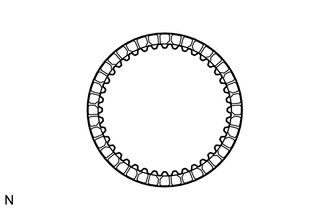 3 brake flanges are worn or burnt. If the lining of any No. 3 brake disc is peeled off or discolored, or even if part of the groove is damaged, replace all No. 3 brake discs. Before assembling new No. 3 brake discs, soak them in ATF for at least 15 minutes. (a) Using a feeler gauge, measure the clearance between the underdrive planetary gear assembly and the pinion gear at 4 points. 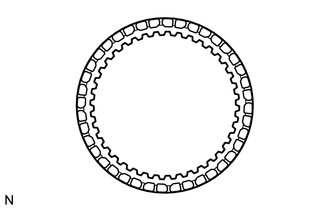 If the clearance is greater than the standard clearance, replace the underdrive planetary gear assembly. (a) Using a caliper gauge, measure the inside diameter of the bushing of the rear planetary sun gear assembly. If the inside diameter is greater than the maximum, replace the rear planetary sun gear assembly. (a) Check if the contact surfaces of the No. 1 brake discs, No. 1 brake plates and No. 1 brake flange are worn or burnt. If the lining of any No. 1 brake disc is peeled off or discolored, or even if part of the groove is damaged, replace all No. 1 brake discs. Before assembling new No. 1 brake discs, soak them in ATF for at least 15 minutes. (a) Using a vernier caliper, measure the free length of the 3 2nd brake piston return spring sub-assemblies including the spring seats. 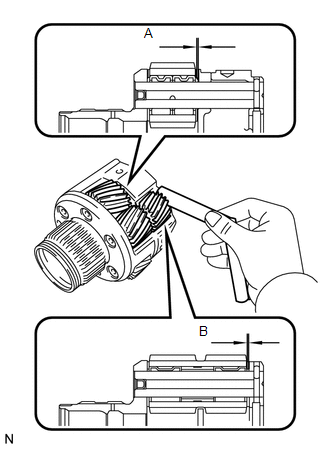 If the free length is shorter than the standard free length, replace the 2nd brake piston return spring sub-assembly. 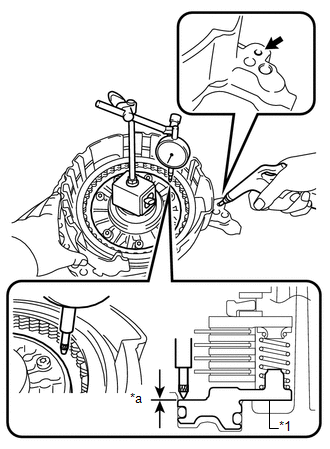 (a) Temporarily install the one-way clutch assembly to the planetary ring gear. 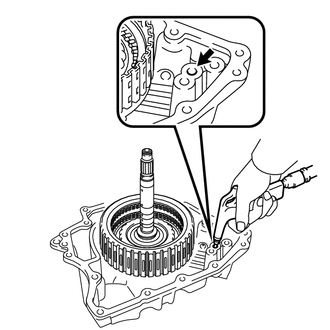 (b) Make sure that the one-way clutch assembly turns freely counterclockwise and locks when turned clockwise. 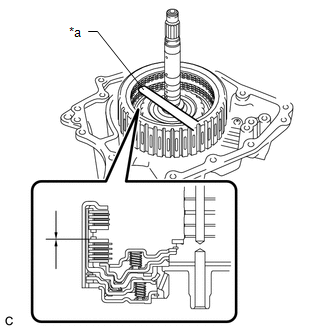 If the one-way clutch assembly does not operate normally, replace it. 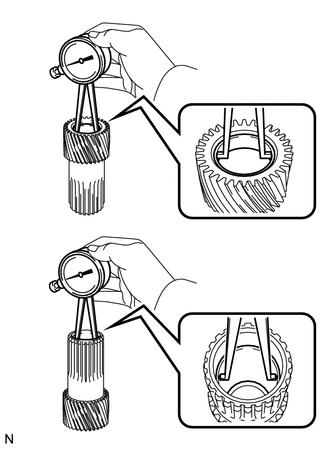 (a) Using a feeler gauge, measure the clearance between the front planetary gear case and each pinion gear at points (A) and (B). 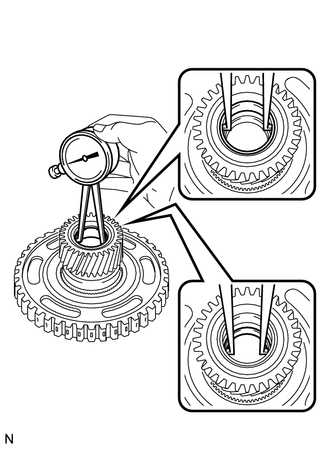 If the clearance is greater than the standard clearance, replace the front planetary gear assembly. (a) Check if the contact surfaces of the No. 2 brake discs, No. 2 brake plates and No. 2 brake flange are worn or burnt. If the lining of any No. 2 brake disc is peeled off or discolored, or even if part of the groove is damaged, replace all No. 2 brake discs. Before assembling new No. 2 brake discs, soak them in ATF for at least 15 minutes. 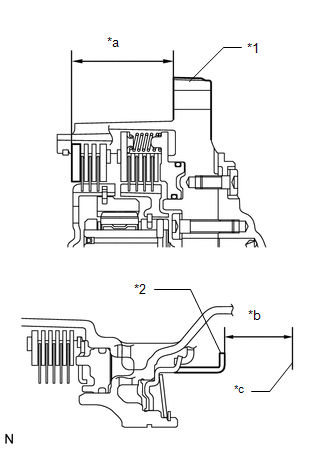 (a) Using a vernier caliper, measure the free length of the 1st and reverse brake return spring sub-assembly including the spring seat. 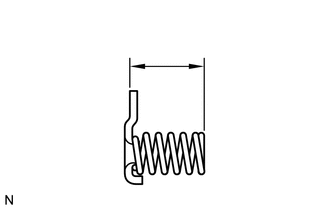 If the free length is shorter than the standard free length, replace the 1st and reverse brake return spring sub-assembly. 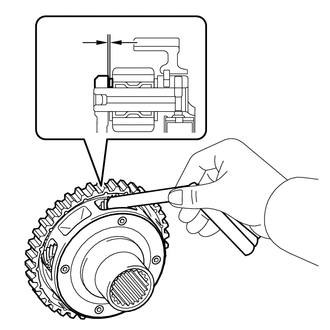 (a) Apply compressed air to the oil pressure supply hole shown in the illustration, and check the operation of the No. 2 brake piston. 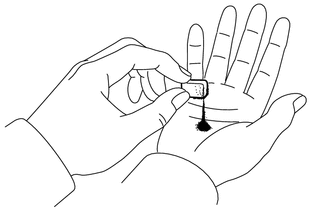 (b) Set a dial indicator as shown in the illustration. (c) Using a dial indicator, measure the clearance of the No. 2 brake while applying compressed air (200 kPa, 2.0 kgf/cm2, 29 psi). 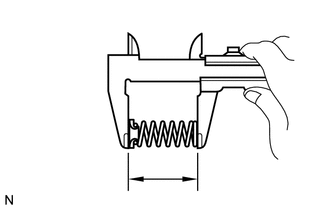 Measure the clearance at 3 points where the brake piston diameter is approximately 140 mm (5.51 in.) and calculate the average. If the clearance is not as specified, select an appropriate No. 2 brake flange so that the clearance will be within the specified range. There are 5 No. 2 brake flanges of different thicknesses. 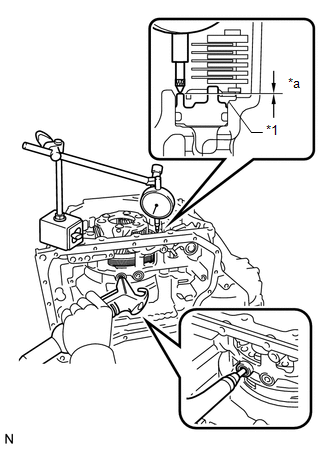 (a) Apply compressed air to the oil pressure supply hole shown in the illustration, and check the operation of the No. 1 brake piston. (c) Using a dial indicator, measure the clearance of the No. 1 brake while applying compressed air (200 kPa, 2.0 kgf/cm2, 29 psi). If the clearance is not as specified, select an appropriate No. 1 brake flange so that the clearance will be within the specified range. There are 6 No. 1 brake flanges of different thicknesses. (a) Using a vernier caliper and a straightedge, measure the distance shown in the illustration (Dimension (A)) while a load of 500 N (51 kgf, 112.4 lbf) is being applied to the flange. Measure dimension (A) at 3 points where the flange diameter is approximately 166 mm (6.54 in.) and calculate the average. (b) Using a vernier caliper and a straightedge, measure the distance shown in the illustration (Dimension (B)). Measure dimension (B) at 3 points where the No. 3 brake piston diameter is approximately 166 mm (6.54 in.) and calculate the average. If the clearance is not as specified, select an appropriate No. 3 brake flange so that the clearance will be within the specified range. There are 6 No. 3 brake flanges of different thicknesses. 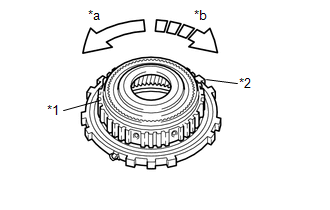 (a) Install the direct multiple disc clutch assembly to the rear transaxle cover sub-assembly. (b) Check that the piston moves when compressed air (200 kPa, 2.0 kgf/cm2, 29 psi) is applied to the oil hole. (c) Using a feeler gauge, measure the No. 1 clutch pack clearance. Measure the clearance at 3 points where the flange diameter is approximately 152 mm (5.98 in.) and calculate the average. 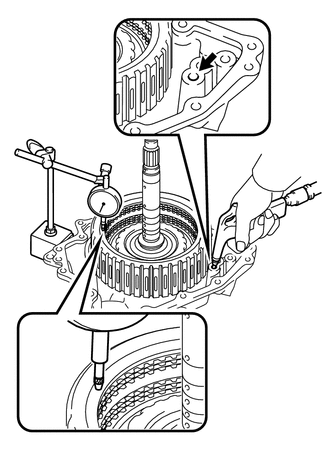 If the pack clearance is not as specified, replace the direct multiple disc clutch assembly. (c) Using a dial indicator, measure the No. 2 clutch pack clearance while applying and releasing compressed air (200 kPa, 2.0 kgf/cm2, 29 psi). Measure the clearance at 3 points where the diameter of the No. 2 direct multiple clutch piston is approximately 152 mm (5.98 in.) and calculate the average.